World War II: Legacies of Northeast Indiana Veterans, will be released soon! An author’s life is full of significant days. Whether we’re researching, writing, publishing or promoting our books, we are in some aspect of working with books. After publishing 11 children’s books, I’m taking what some people might consider to be a 180-degree turn in writing. For the past 3 years I’ve been interviewing World War II vets in my area. This year I decided to put some of those stories into a book. That title, World War II Legacies: Stories of Northeast Indiana Veterans, is due to be released in October! Here’s a look at the book’s cover. 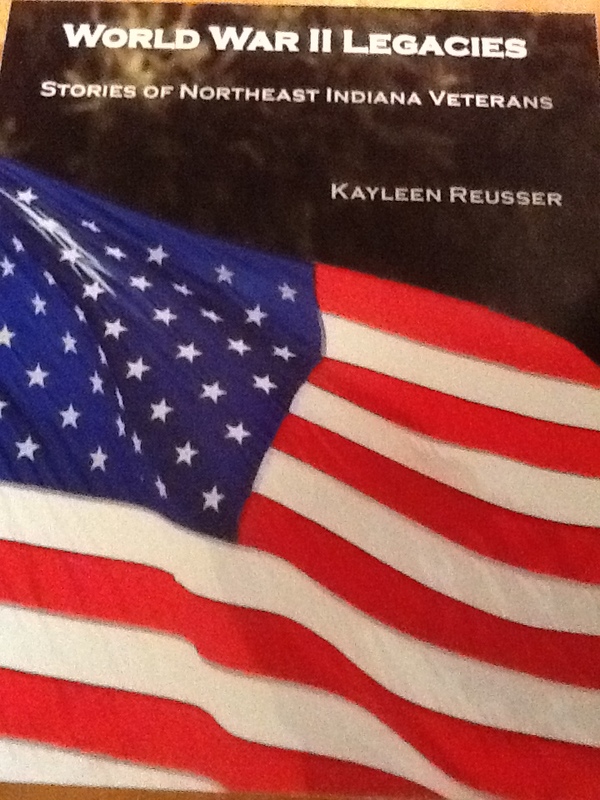 It contains 28 stories of veterans living in Wells, Adams, Allen, Huntington and Whitley counties. I invite you to order a copy for a loved one for Veteran’s Day, birthdays, Christmas. The stories include personal accounts of experiences of crawling through the sand as a medic on D-Day while bullets whizzed overhead; flying over Holland during Operation Marketgarden with enemy bullet holes spewing fuel; sleeping in foxholes in freezing temps in Belgium during Battle of the Bulge; assembling a radar station in northern Africa. Each story is the result of an interview with the vets, most of whom are still living. Each has provided permission for me to publish their stories which they have previewed. This book should be of particular interest in 2015 as we recognize the 70th anniversary of Battle of the Bulge, Iwo Jima, Okinawa and end of the war in summer! Please contact me to order a copy of the book. I’ll post more information about ordering the book in future posts. I’ll also include excerpts from the book, speaking engagements, tidbits of info ab the war and other books I’d recommend reading about the war. I hope you’ll share your thoughts about your family’s experiences with the war in the Comments section. I find each story is fascinating! Make My Faithfulness Like a Double Shot of Espresso! Hi Kayleen, I would love to have an autographed copy for Frank for veteran’s day. He served a tour in Vietnam after law school and before starting his law practice. He carried a radio on his back much of the time and once ran through a mine field, earning a Bronze star with three clusters. Will you be coming to Fort Wayne anytime in the next month or so? Would love to see you and catch up! So happy for you on the upcoming release of you 12th book! !